Since 1916, the national park system has been the treasure of the American landscape. With over 400 locations covering 84 million acres across the United States and its territories, national parks attract nearly 279 million visitors, employ 22,000 full-time, part-time and seasonal professionals and infuse $31 billion into the economy on an annual basis. 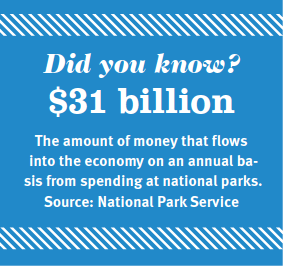 However, on March 1 the National Park Service was required by the federal sequestration to slash $153.4 million from its budget — a measure that reaches far beyond park borders and into neighboring municipalities. 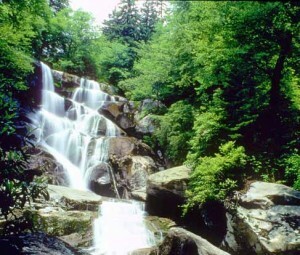 “Tourism is the second largest industry in the United States. So when you close down national parks or restrict them in any way, there’s a ripple effect in the surrounding communities that benefit from people coming to see a historic treasure,” said Bill Beckner, senior research manager for the National Recreation and Park Association. While the impact of sequestration varies from park to park, make no mistake about it: The impacts are being felt. Although concrete numbers will not be available for some time, some of the cuts have had the predicted effect. According to Jeffrey Olson, public information officer for the National Park Service, fewer employees resulted in longer lines at entry stations — especially in the larger areas such as Grand Canyon National Park. Programs were cut, trash collection and maintenance was less frequent and daily hours of operation were curtailed. A number of national parks, including the Harry S. Truman Historic Site in Missouri and the James A. Garfield Historic Site in Ohio, went as far as to close one or more days during the week. Several campgrounds along the Blue Ridge Parkway in Virginia and North Carolina remained closed throughout the summer, which resulted in fewer tourists staying in the area. Gateway communities, the economic engines of which are often driven by the presence of a national park, have stepped in to help where they can. Friends groups, businesses and even local governments have tried to provide support whenever possible. Going-to-the-Sun Road is the primary access road across Glacier National Park. It’s a 50-mile stretch that’s on the National Register of Historic Places and is iconic in every sense of the word. According to Olson, the park relies on that road being open at the start of the season. 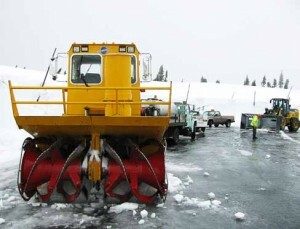 It takes an army of snowplows to get the job done. When it appeared that, due to budget cuts, there would be a delay in the opening of the road, the Glacier National Park Conservancy came forward with a generous offer that enabled the park to hire the snowplows needed to open the road on time. “We greatly appreciate the financial offer from the Glacier National Park Conservancy. Their timely support will allow for the continuity and emphasis we place on snowplowing activities, especially as crews approach the ‘big drift’ near Logan Pass, and the culmination of the tremendous road opening effort,” said Kym Hall, acting Glacier National Park superintendent. In another instance, a $135,000 donation to Grand Teton National Park by associates who work with the Laurance Rockefeller Preserve Center, the Grand Teton Association and an anonymous donor saved a visitor center, ranger station and preserve center from being shuttered this summer. Unfortunately, however, the stories suggest that acts of assistance are one-time events and unlikely to be repeated in the event of a continuum. “If Congress can’t agree on a budget, then the cuts will remain, which means that there will still be jobs that won’t get done, positions that will remain vacant, fewer guests coming to the park and less revenue for us and our gateway communities,” Olson said. Olsen said that national parks worked hard to take the bulk of their cuts on the shoulder of the season in order to be in good shape during peak tourism months. But even the smallest slice can affect tens of thousands of guests. Jonathon Jarvis, director of the National Park Service agreed. In his testimony to Congress on July 25, he said sequestration was designed to be inflexible, damaging, and that it undermines the work needing to be done.